Child Star - Don’t you wish you knew a lot more about your child – not just through the learning experience of growing up, but ahead of time, from birth? Here is an insightful perspective that can help you instantly attune to how best to guide your child. Click here to fill out birth data and order your Child Star Report now. Understanding leads to awareness and the possibilities and challenges your child can look forward to in their life. Identify strengths, weaknesses, aptitude and potentials. 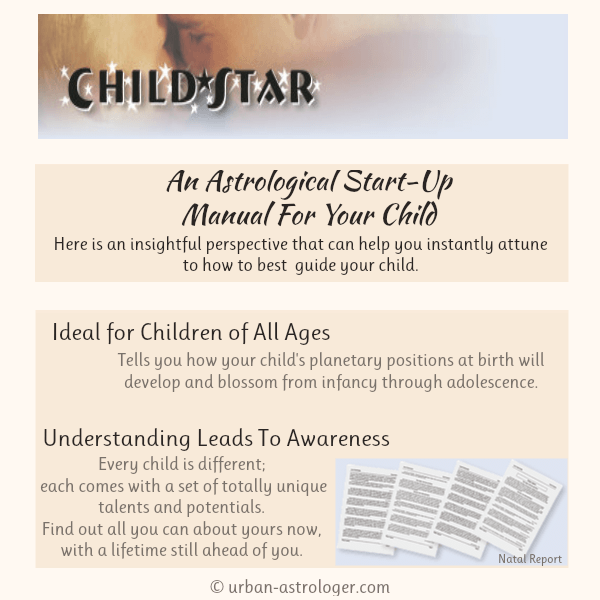 This remarkable personal child report that tells you how your child’s planetary positions at birth will develop and blossom from infancy through adolescence. This is not only perfect for newborns. It is also ideal for children of all ages. Shedding much light on how to better understand your child. Every child is different; each comes with a set of totally unique talents and potentials. Find out all you can about yours now, with a lifetime still ahead of you. When you read it, you will wish your parents had had this as a guide! Current 'Special Pricing' for your Child Star custom report is $15.95 CAD. This will help you to instantly attune to how best to guide your child. These are comprehensive, detailed reports hand processed personally by me. They are custom interpretations and are created specifically for you.